President Donald Trump pauses at the podium as he arrives for a ceremony at the Memorial Amphitheater in Arlington National Cemetery on Memorial Day, Monday, May 28, 2018, in Arlington, Va.
President Donald Trump paid a Memorial Day tribute at Arlington National Cemetery on Monday, saying he came to "sacred soil" to "honor the lives and deeds of America's greatest heroes." 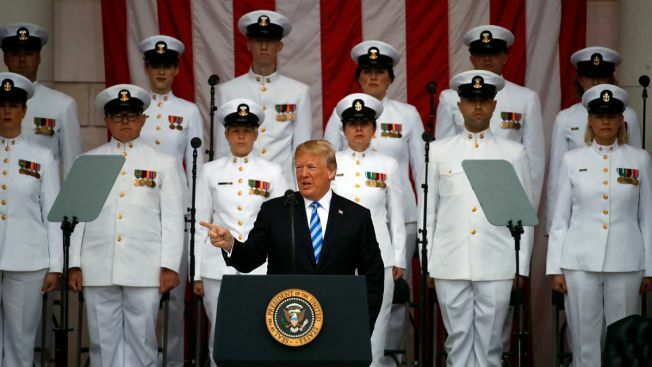 The commander in chief, speaking before an audience of Cabinet members, military leaders, veterans and families assembled in the marble amphitheater near the Tomb of the Unknown Soldier, said, "We mourn alongside their families and we strive to be worthy of their sacrifice." Trump's somber tone contrasted with a self-promotional tweet earlier Monday in which he said fallen soldiers would be "very proud and happy at how well our country is doing today," citing the economy and low unemployment. Trump said the boy showed him his father's grave last year, calling it "a moment I will always remember." But the president then veered from the somber to the self-congratulatory in the tweet, citing what he said was the "Best economy in decades, lowest unemployment numbers for Blacks and Hispanics EVER (& women in 18years), rebuilding our Military and so much more. Nice!" The president also posted quotes in line with his criticism of the Justice Department and investigations into ties between his winning campaign and Russia. He was criticized for his tone by a number of people, including a former chairman of the Joint Chiefs of Staff during the Obama administration, retired Army Gen. Martin Dempsey, who wrote, "This day, of all days of the year, should not be about any one of us." Memorial Day messages from first lady Melania Trump and Ivanka Trump, the president's daughter, struck to a theme of remembrance and thanks. And Melania Trump thanked service members and their families for helping safeguard the country. "We honor the many Americans who laid down their lives for our great country. As one nation under God, we come together to remember that freedom isn't free," she tweeted.